In content marketing, it’s easy to forget the simple additions to our websites, blogs and social media in exchange for complex tactics. What if we told you that your website content writing strategy is missing one simple, but critical, tool? And what if we told you that one simple addition to your Facebook page could increase your website click-through rates by 285%? What is this simple addition? Why a clear call to action! 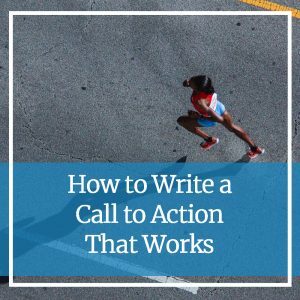 A call to action (CTA) is one of the most important tools you can use in your content. Why? People don’t want to think too hard about what they need to do next—they simply want to be told where to go. That’s where your CTA comes in. A CTA is a link on your website that directs your visitors to perform an action. This could be anything from “Call Us Today” to “Schedule Your Consultation” or “Download Our Free Guide.” CTAs are one of the most valuable tools you can use to drive conversions online. More than 90% of visitors who read your headline also read your CTA copy for next steps. If that’s not enough to convince you, emails with a single call to action increase clicks 371% and sales by 1617%. Put simply, a CTA is conversion’s easy button. Want More Tips for Creating Compelling Website Calls to Action? Yes, get me my guide! How do you create a CTA that actually works? The CTA formula includes copy that compels your audience to move forward while being clear and obvious to your reader. Your CTA should live on the bottom of every page. Depending on where they’re coming from, your visitor might land on a page other than your Home page. Don’t miss the conversion opportunity by only placing your CTA there. It’s easy to want to be flowery or use a clever catchphrase in your CTA. After all, it needs to capture your reader’s attention. However, a direct and simple CTA is easier to follow and won’t confuse your visitor. Confusion causes hesitation and there’s no room for that in your copy. When it comes to writing CTAs, it’s best to focus. If the goal of your website is to have your readers call you for a consultation, use that as your CTA. Don’t ask your visitors to sign-up for your email updates, call you and download your free eBook all on one page. Visitors will be confused on which direction they should choose, causing them to click away in frustration. Just like the rest of your content, your CTA should be personal and speak directly to your reader. For example, “Download My Free Checklist” is much more personal than “Download the Free Checklist.” Personal copy is friendly copy. Your CTAs are super important to your content marketing strategy. If you’re stumped, a professional copywriter can help you tailor your CTAs to match your brand, your voice and your goals. To learn more about CTAs or for help, reach out to our team online!